Two weeks ago, the buzz surrounding the Buffalo Sabres was the highest it had been in over a decade. The team had just won their tenth consecutive game and it appeared that a playoff run was not only a possibility but a likelihood. 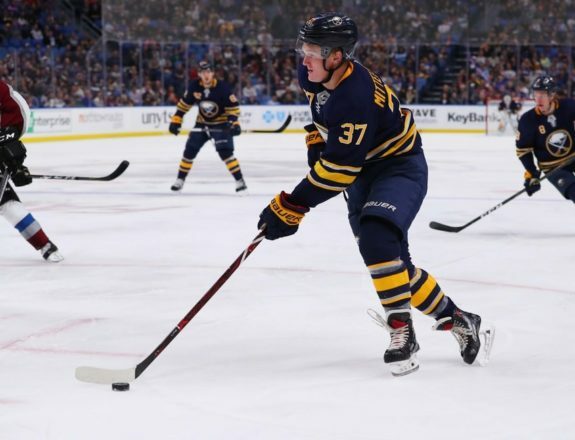 For the first time in a long time, spectators at KeyBank Center were engaged and the Sabres were the talk of Western New York. Since the team’s aforementioned winning streak came to a conclusion, the blue-and-gold have dropped five straight decisions (three of which came in regulation). On Saturday afternoon, reality struck as Buffalo was pummeled 6-2 on home ice by the Philadelphia Flyers (a team that currently sits in 15th place in the Eastern Conference). Battling a myriad of injuries on the blue line, the Sabres went from “scary good” to sub-par in short order. Injuries aside, their inability to produce offense outside of the top forward line continues to be a concern. 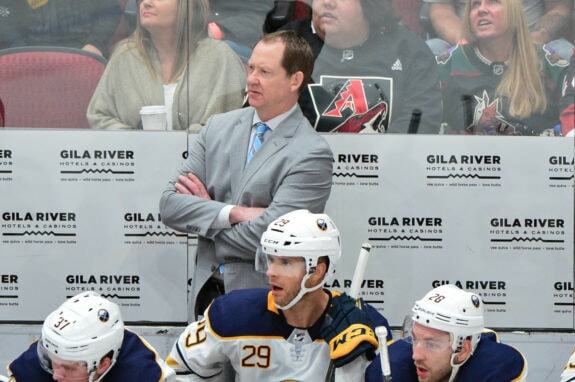 With 52 games remaining on the schedule, there is a whole lot of hockey left to be played and Phil Housley’s squad simply cannot continue down their current path. This string of losses needs to serve as a wake-up call that a strong month of November is not enough to secure the organization’s first playoff birth since 2010-2011. With Marco Scandella and Jake McCabe still sidelined with injuries, the Sabres are relatively thin on the back-end. On top of that, offseason acquisition and depth defenseman, Matt Hunwick remains on injured reserve (though, he did begin skating with the team last week). Through the first third of the season, Buffalo was fortunate to remain mostly healthy as several of their Eastern Conference competitors were dealing with injury issues of their own. To make matters worse, on Friday afternoon it was announced that starting goaltender, Carter Hutton was battling an ailment which would keep him out of the lineup for their Saturday matinee against Philadelphia. 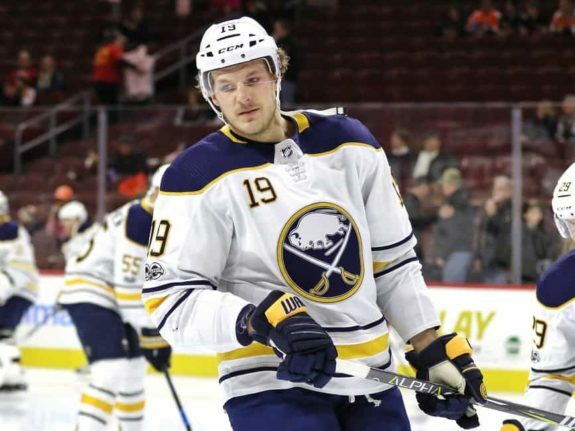 As it stands, the Sabres’ front office has been forced to call-up minor-league reinforcements like Matt Tennyson (a player who should never dress in an NHL game again) to help fill the void. At some point, every team gets bit by the injury bug. It’s just the nature of the sport. In fact, it’s a bit of a blessing in disguise that the team is being forced to face this adversity following such an impressive win streak. If nothing else, they’re coming back to Earth during a time where their true mettle will be tested. How they respond to the current losing-streak will indicate to the rest of the league just how ready the Sabres are to make a legitimate postseason push. Even when the team was winning, their inability to consistently produce offense outside of the top forward line was obvious (and quite frankly, unsustainable). 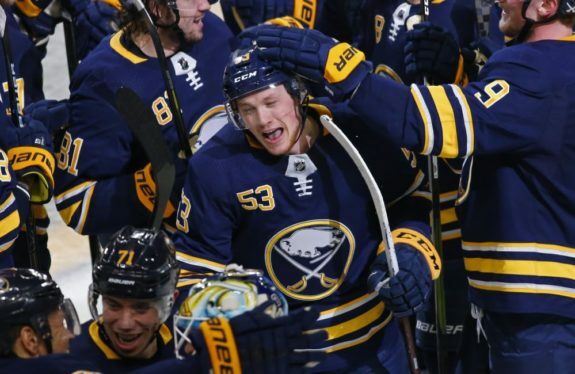 Over the last five games, that problem has been exacerbated with 10 of their 12 goals coming from either Jack Eichel, Sam Reinhart or Jeff Skinner. The onus now falls upon the second and third line to start pulling their weight on offense. The fourth line has been utilized primarily as a defensive shut-down line so their limited production is to be expected. The hope was for Jason Pominville to help catalyze the Sabres’ scoring depth by bumping him down to the second line beside rookie, Casey Mittelstadt but that experiment has failed thus far. At this point, it might be wise for Housley to move right wing, Sam Reinhart off of the first line and put Pominville back with Eichel and Skinner. It’s already been proven that Pominville is capable of producing offense on the top line, but the rest of the lineup needs an influx of scoring talent. Reinhart is on fire right now with nine points in his last six games. Putting him with Mittelstadt could help give the young man a boost. Either way, something has to give. It’s entirely possible that the team just doesn’t have the talent to sustain secondary scoring on a consistent basis this season. They’re not very deep at center and they’re still very young and inexperienced across the board. Perhaps as the season wears on, it would be wise for Jason Botterill and the gang to try and insert one of their young, talented forwards currently playing in the AHL into the lineup. Should their hold on a playoff spot slip any further, they may not have much choice. One of the over-arching themes during the Sabres recent skid has been their inability to convert with the man-advantage. Buffalo currently ranks 18th in the NHL on the power-play, capitalizing on 18.1-percent of their chances. On the surface, that number doesn’t appear terrible by any means, but they’ve been particularly bad over the last five games, going just 1-for-13 since their winning streak came to an end. Housley has tried a handful of different combinations on both the first and second units. He even tried giving Patrik Berglund a chance to help turn the tides (an experiment that failed miserably). With so much offensive firepower, particularly on the top unit, their inability to capitalize is troubling and it’s a significant part of the reason why they’ve been losing. As has been the case with nearly every facet of the game for the Sabres this season, it all boils down to depth. They simply do not have the firepower throughout the lineup to get into track meets with other teams. Once the defense gets back to full-strength, this problem won’t seem as dire, but still, it’s a significant area in need of improvement.